To better understand how host ecology determines disease dynamics, I work with populations of brown mouse lemurs (Microcebus rufus) in the southeastern rainforests of Madagascar. Mouse lemurs are the smallest primates in the world, and their arboreal, trappable nature, and longevity in the wild (up to 9 yrs) make them an ideal study system to understand population disease dynamics longitudinally. Using this system, we aim to understand the morphological, social, endocrinological, behavioral, microbial, and age-related risk factors that contribute to heterogeneous parasite distributions in host populations. Around 65 mya a small ancestral primate came over to the island of Madagascar, occupying all of the island's ecological niches from the western spiny deserts to the eastern montane rainforests. This ancestral primate eventually diversified into the over 100 species of lemur living on the island today. 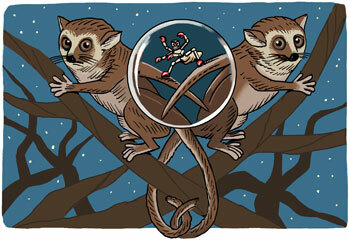 These lemurs range in size from the tiny mouse lemur at 40g to the 20kg indri. While giant lemurs once existed, they have gone extinct since the arrival of humans to the island ~1500 years ago. This trend continues today, and lemurs are the most endangered mammals on earth due to habitat loss, making them a top conservation concern. Due to their rich biological history lemurs are an excellent model system to study evolutionary biology, island biogeography and early primate evolution. Lemurs are also home to many unique parasites and pathogens, making them an excellent model system to study the ecology and evolution of primate diseases.